This Chinese restaurant at Vivocity has a unique name, 黑社会. In English, it translates directly to Secret Society. As with the name, the entire restaurant is painted in black, giving it a very posh and somewhat fearsome exterior. I had passed by the restaurant umpteen times but never once did I made it inside. Recently, a colleague informed me that she was there for lunch and that the Chinese ramen is quite reasonably priced at ~$7. With this information, I decided to give it a go. On a Friday afternoon, this was the few restaurant without any queue. We were shown straight to a round table and there wasn’t many customers inside either. 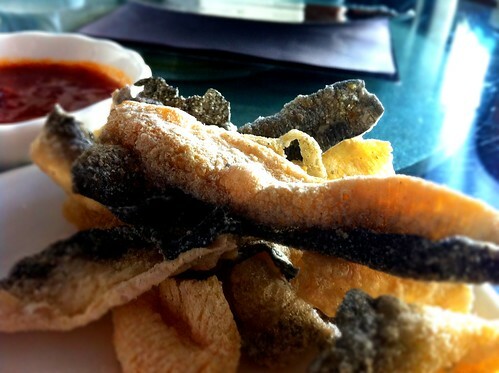 We were served with a very interesting appetizer – deep fried fish skin. It was coated with dashes of salt, extremely crunchy to the bite, not oily at all but can be a little fishy on the taste bud. But when accompanied with the chili, it sort of masks the fishy taste. A plate of this appetizer is priced at $3.80. A quick glance at the menu revealed that the more affordable dishes were indeed the ramen – starting from $7 onwards for plain vegetable ramen. I ordered the fried chicken ramen which consisted of a huge bowl of plain soup ramen and a small plate of deep fried chicken. Definitely low rating for presentation. 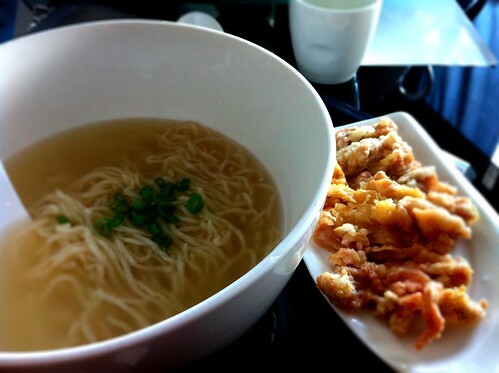 Taste-wise, the soup was plain, noodles tastes like instant noodles and the fried chicken has no surprises either. Priced at $8.50, you can definitely give it a miss. Three colleagues ordered the minced meat ramen (炸酱面) priced at $8 and was full of praises towards the end as they were busy slurping up the noodles.